A wise man once said that a picture can speak a thousand word; well essentially if not a thousand then at least a hundred! When a neutral observer looks at a picture and scrutinises it, a million thoughts strike the complex mind. A photograph titled Explosion of emotions that shows sparks of light which somewhat looks like a firework to the naked eye may appear to be a moment captured during celebrations or can depict something completely different to someone who is thinking deeper into the picture. The stereotype convention of associating fireworks or colourful sparks of light with celebrations is quite a common phenomenon but think about the sparks of light that are produced by the drilling machine during a construction work. Can that be really associated with the happiness or merriment that is a product of celebration? Not quite, because that kind of outburst of emotion can often be of sadness and melancholy as well. The hard work and labour of a construction worker behind the drilling machine can also be depicted by those bright spectrums of light. Similarly, a number of pictures like the aforementioned one were displayed at the exhibition organised by the 09 batch students (all departments inclusive) of BUET. This exhibition was an initiative taken by four students of the 09 batch, Rubayet Sadnan, Farshid Raihan, Javed Miandad and Palal Ghosh. 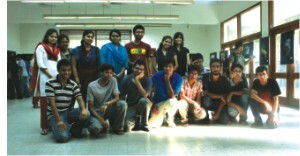 Being members of the Photographic Society of BUET and also following in the steps of their seniors, they felt the need to organise this three-day, May 30 to June 1, 12:00 am--6:00 pm on-campus exhibition to showcase their experiences and moments of the year 2010. Don't play, a photograph taken by Moinul Islam was a picture of a small Muslim boy wearing a tupi (a religious hat). This photograph drew emphasis on religious and social obligations. The boy's facial expression illustrated sorrow and quite explicitly showed the religious and social restrictions inflicted upon the youth by the society as a whole. On the contrary, Chocolate mountain, a picture taken by Nuzhat Maisha expressed different emotions. This picture was of a scrumptious slice of cake with candles surrounding it creating a dark ambience. Allegorically, it could mean temptation and can be correlated to a symbol of something romantic due to the atmosphere created by the candle light. But it turns out that, to the photographer, it was just one indulgence she cannot simply resist! In conclusion, these photographs not only captured moments of life, culture, religion and pleasure within the four corners of a frame but they also drew emphasis on the minute details that are barely noticeable in mundane routines of life.